Libertarian vice presidential candidate Bill Weld greets supporters at his 2016 election night party in Albuquerque, New Mexico. Weld, a former governor of Massachusetts, on Monday became the first Republican to challenge President Donald Trump in the 2020 primaries. 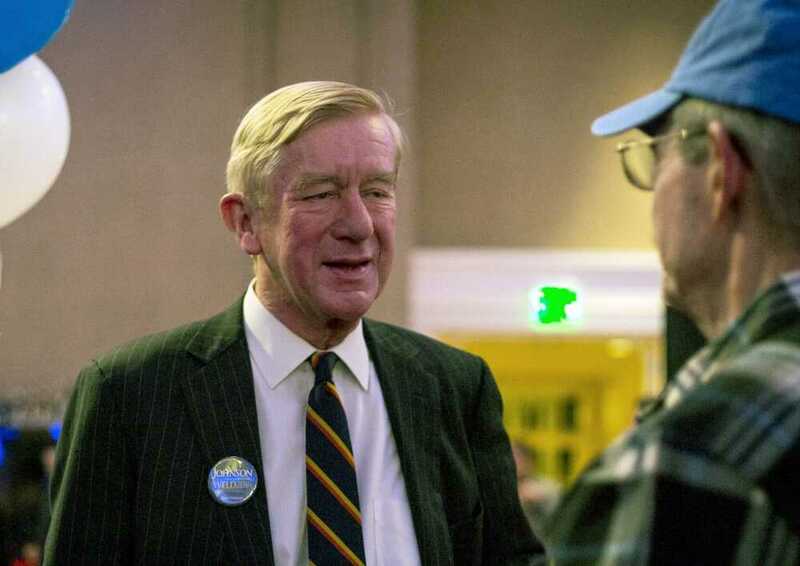 BOSTON -- William Weld, a former governor of Massachusetts who two years ago ran for vice president on the Libertarian Party ticket, on Monday became the first Republican to challenge President Donald Trump in the 2020 primaries. Weld, 73, said in announcing his candidacy "it is time to return to the principles of Lincoln -- equality, dignity and opportunity for all." He said, "There is no greater cause on earth than to preserve what truly makes America great. I am ready to lead that fight." Alternately a politician, federal prosecutor, investment banker, lobbyist and even novelist -- his political mystery called "Mackerel by Moonlight" was published to mixed reviews in 1998 -- the Harvard-educated scion of a prominent Boston family was a lifelong Republican before bolting the GOP to run on the Libertarian Party ticket with former New Mexico Gov. Gary Johnson in 2016. Despite a pledge to libertarians he would remain loyal to the party going forward, Weld on Jan. 17 walked into the clerk's office of the Massachusetts town where he lives and re-registered with the GOP, adding to speculation he would challenge Trump in the primaries. He resigned as governor the following year after Clinton nominated him to be ambassador to Mexico, but it was a post he would never hold. Helms dug in his heels and refused to schedule a hearing on the nomination, claiming among other things Weld's support for medical marijuana and needle exchange programs for drug users disqualified him from serving in Mexico because of that country's history of drug trafficking.